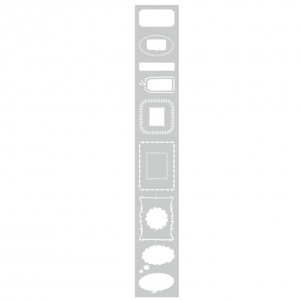 Featuring 8+ different individual designs based around frames, boxes and speech bubbles, this super long self-adhesive stencil is used for decorating paper, glass, ceramic, MDF, wood plastic, mirrors, metal and textiles. The stencil is sized 10.5cm x 70cm and we recommend cutting it for ease of storage. To use it it, remove the film from the adhesive side of the stencil and place on a clean, dry surface. Apply the appropriate ink for the surface and remove. After use, clean with water and once dried, it can be stuck to the inside of the packaging to protect the sticky side. Due to the length of the stencil, it will be rolled for ease of despatch.